For millennia, and across the world, people have been creating patterns–from ancient Egyptian art, to Turkish carpets, to Chinese silks, to tattooing or ornamental scarring. Human beings crave pattern, writes E.H. Gombrich in his book The Sense of Order: A Study in the Psychology of Decorative Art, because we have an innate desire to make order out of chaos. Maureen’s approach to decorating is exactly that: to select a shape from the natural world and stylize it. Although the natural world is full of patterns, they are often so jumbled together, or so small, we don’t immediately notice them. Especially at first glance, the natural world can appear chaotic. 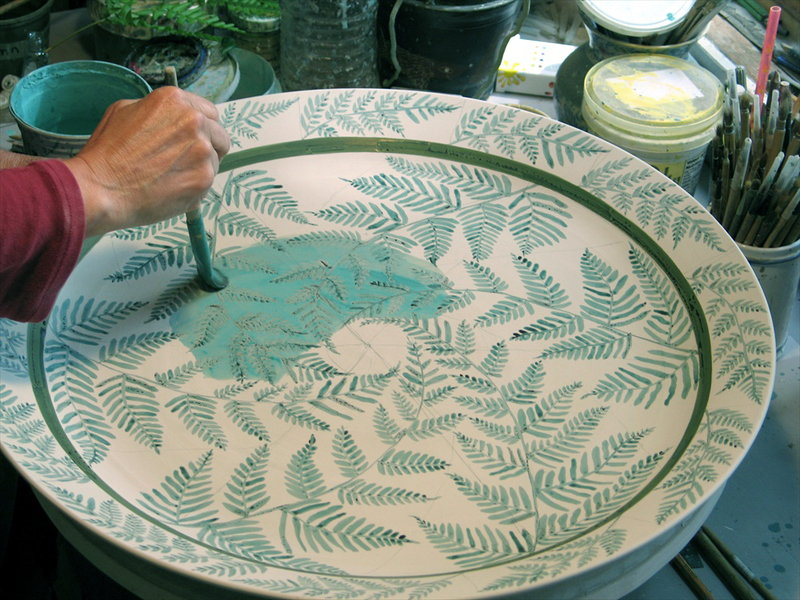 Maureen isolates a shape from the tangle of green, and transforms it into pattern on her pottery. Maureen’s preference for an ordered pattern is facilitated by the constraints of her medium. For example, because she decorates a flat surface, her patterns must be two-dimensional. Also, because she throws her pottery on a wheel, she must work within a circle. Far from lamenting these constraints, Maureen finds them helpful. In this, she is not alone; most artists work better with certain restrictions. Or, in Gombrich’s words, “Man can only be creative in relation to problems which he seeks to solve” (64). 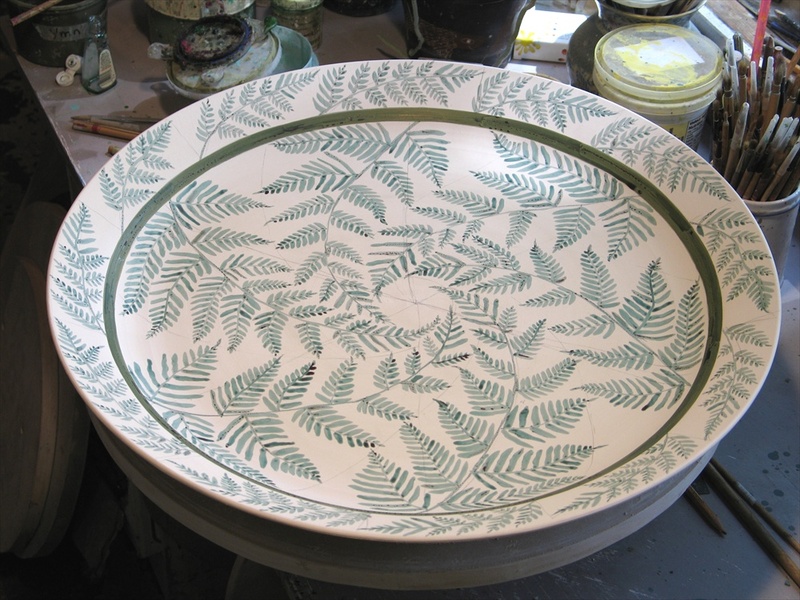 For this fern platter, Maureen isolated a fern from the chaos of the foliage lining our road. Then, she had to decide how to make that fern fit into the circular space of the platter. To do this, she subjected the piece to geometry–she divided the platter into six equal areas and, with wax resist, painted a frond in each one. She chose to arrange the fronds in a pinwheel shape to create a dynamic of movement and energy. A further structural constraint with a large platter is that it often has a rim. This is another element that dictates the pattern, Maureen explains. 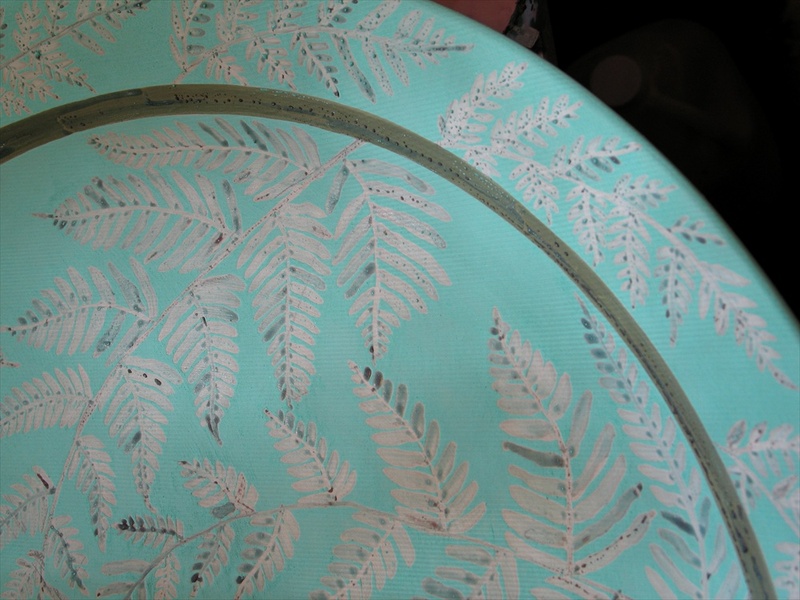 She paints a different fern pattern on the rim to accentuate the separation between interior and exterior, a difference created initially by the construction of the platter. As you can see, though the ferns are still recognizable as ferns, Maureen is not interested in a representational image; she does not show the ferns as they would appear outside, growing in a clump, upwards from the ground. She looks at a fern while painting, but does not try to capture its every leaf, its every meandering vein. Her decorating style also discourages any attempt at realism. 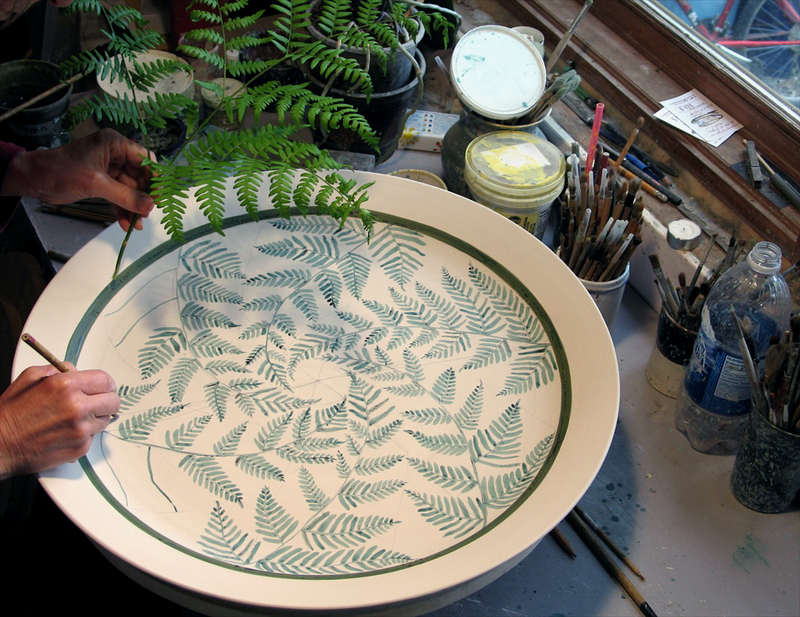 Instead of painting a fern in green, she paints it in wax resist, which, when fired, will burn off, leaving white ferns. It is the background she paints green. She is more concerned with the negative space of the fern. 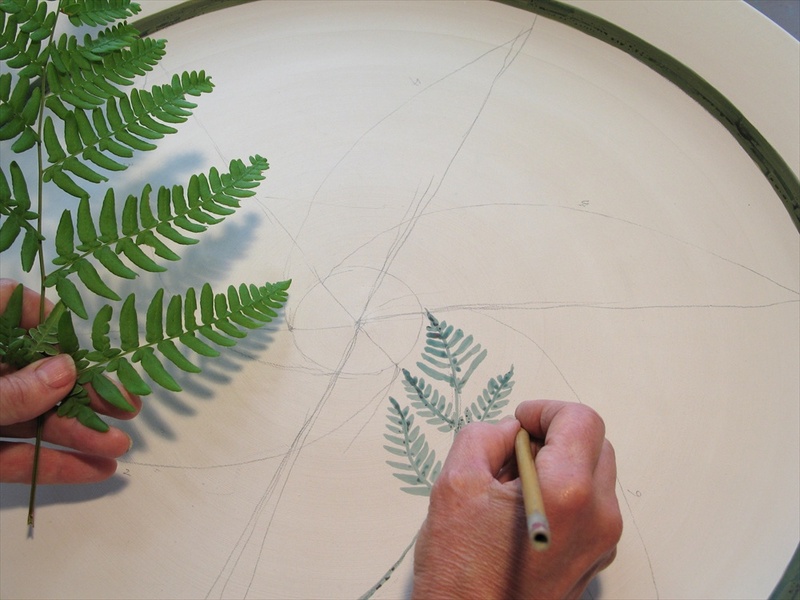 In all of this, she is organizing the natural world, stylizing the ferns to fit the constraints of her platter, thereby satisfying what Gombrich would call her innate sense of order. However, writes Gombrich, though we crave order, we are bored by too much of it. As in most things, we find pleasure in balance, not extremes. The “most basic fact of aesthetic experience,” writes Gombirch, is that “delight lies somewhere between boredom and confusion” (9), between order and chaos. This is a balance Maureen understands well. Maureen’s pottery, as anyone who knows it can attest to, is not a series of rigid geometric shapes. On top of her underlying structure, Maureen paints freehand. 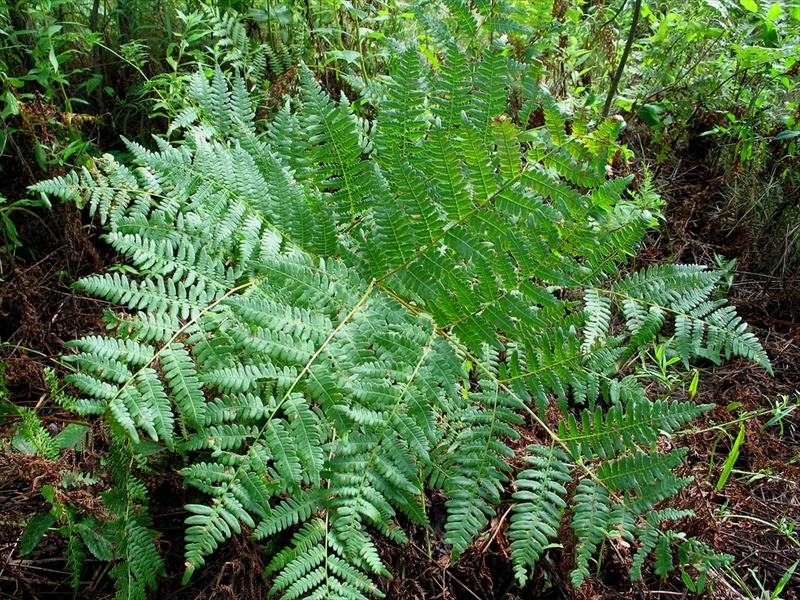 Each frond, though allotted the same amount of space on the platter as the others, is different. The wax pools, her hand wavers for an instant, she does not count the leaves.The copper slip she applies over the wax is also variable. She does it quickly, and does not mind if it streaks. 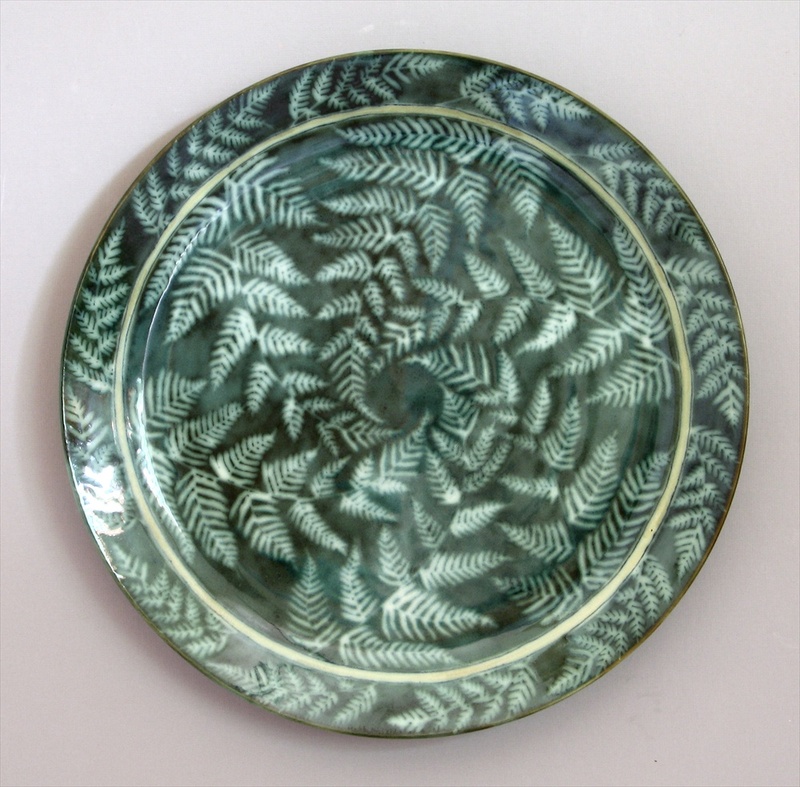 And so you have the creation of a fern platter: from a clump of freely growing ferns, to a precisely divided platter, to a freely painted, but stylized, negative image of a fern shape. Still recognizable, but also entirely different. The platter is beautiful for many reasons, but, if we are to agree with Gombrich, “it is the contrast between disorder and order that alerts our perception” (6). What a beautiful explication and exploration. Thank you Allegra–and Maureen! It is such a delight to read about the design rationale for Maureen’s artistic expression. Like understanding the structure underneath music, your explanation enriches my appreciation of her gorgeous pieces. And, bonus, beautifully written. Thanks Allegra. Thank you Mary Lou. It’s funny, I was thinking about the parallels to music as I was writing this post. I’m sure you think about many of the same ideas when you play piano. Thanks for another insightful comment, Marie! Allegra, I really appreciate reading you. Although English is not my first language I understand all what you say very easely. The words just flow so nicely and everything is clear. I also appreciate that you mention the reference (Gombrich). So often it is difficult to understand artist’s speaches or what critics write about artists. They make us feel ignorant and discourage people from the simple pleasure of enjoying art. At the opposite you share with us the pleasure you ressent from Maureen’s work by sharing the information that your presence in the Studio gives you access to. What a pleasure to look at Maureen’s work through your eyes ! There is also in your blog a perfect balance between the images and the text. The images bring us directly into your garden and your workspace. I have always felt priviledged to share this intimacy with your family and, through your blog, you make it go on for me and so many others. The world needs more Allegras ! Thank you very much, Raymond. Your comments are so encouraging. I’m so happy that after all these years of friendship, you can still learn something new about Maureen and David’s work. Thank you for reading and replying. Like the others who have responded to your essay on the fern imagery in Maureen’s work, I am admiring of the sensitivity and insight you bring to her process. It is a rare talent to be able to write so eloquently about an artist’s technique, intent and the long tradition of pattern her work exists within. Countering the sense of order, innate in pattern, is her sense of freedom in not being stylistically rigid. I very much enjoyed the text and imagery.